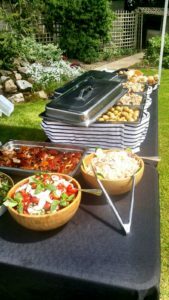 At the weekend we had been asked to cater for an anniversary party with a hog roast Balham, and not just any anniversary a Silver Wedding! We know the couple and we have catered for them before and we were really excited to see them again. Jill and Bob have been with us for years so to speak we have catered for family birthdays, christenings and anniversaries but this one was a special one and we were going to make it the best! We arrived at their home a few hours before and chatted with the couple as they went off to get ready we started work on the hog roast Balham. We placed a lovely brisket of beef on the machine and made some spicy dice potatoes too! On another machine we placed lots of potatoes to roast and made an assortment of fillings chicken and pasta tuna and sweet corn to name a few. We made an assortment of salads and dips and a wonderful feta cheese salad. We brought with us some lovely quiche the couple love our quiche and request it for every event we host for them. We placed a huge slate tray of cheeses all sliced and ready to enjoy and within an hour the fest was complete! As the couple came and their guests they were literally in shock as they looked at the food and we couldn’t wait until they tried it, when the beef was cooked our chef sliced the beef into nice chunky slices the meat just melted in the mouth and was ever so tender Jill and Bob said “ you never fail to amaze us” and that did make us smile we chatted to the guests lots of old faces we recognised and had a lovely day as did the guests. 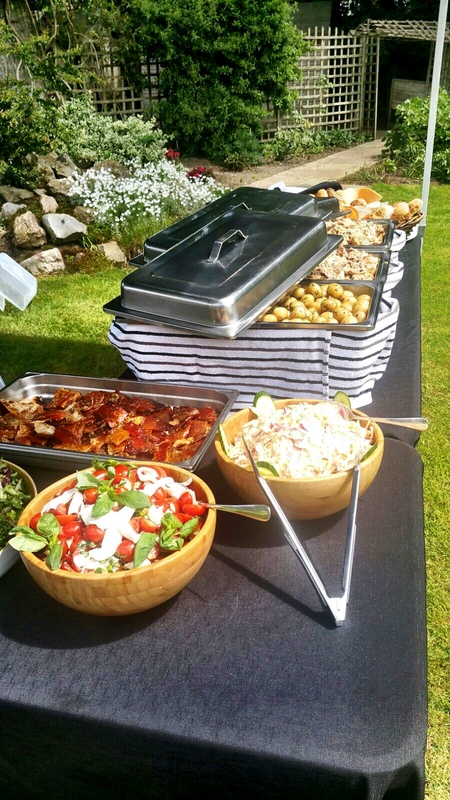 We left a bundle of menus for guests and some came over there and then asking if we could cater for an event for them with our hog roast Balham we were happy to say yes. We stayed a little longer than we should as we enjoyed a few glasses of bubbly to toast the happy couple, a wonderful day was had by all.